Alexey Guzey and Gwern also started lists. This chart is from the AEI and in turn based on BLS data. Spending on healthcare in the US is up 9X in real terms since 1960. K12 education spending in the US has increased by 2-3X per student per year since 1960. 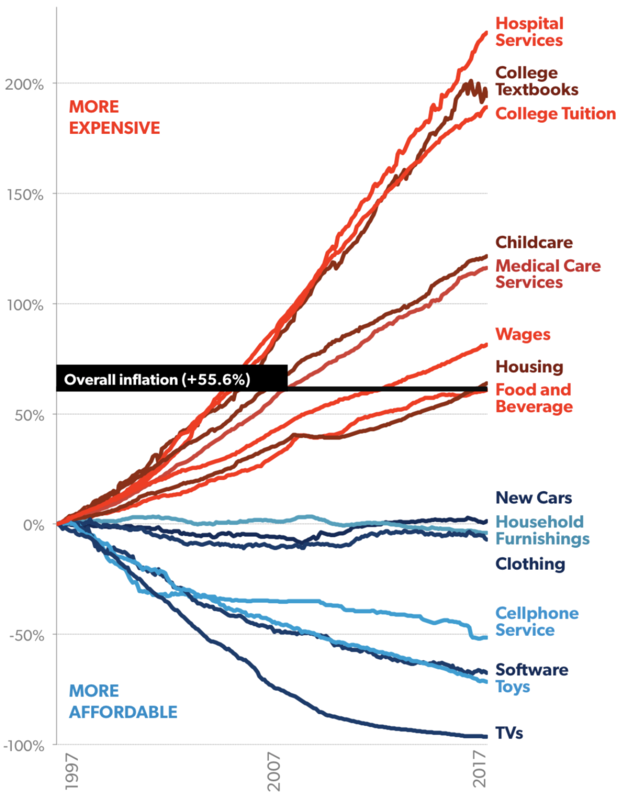 The cost of college in the US has more than doubled (again, in real terms) since 1984. Growth in everything from construction costs to childcare costs is significantly outpacing inflation. Lots more at SSC and from Tyler. What's going on? Why are we seeing dramatic declines in costs in many areas of the economy and such steep increases in others? How much of the cost growth is unmeasured improvement in quality and how much is growing inefficiency? How should one predict a priori whether a sector will exhibit increasing or decreasing costs relative to inflation? What do we do about it all? Response to this question from Arnold Kling. The Empire State Building was built in 410 days. The Lockheed P-80, the first jet aircraft deployed in the Air Force, took 143 days from project initiation to first deployment. Marinship went from "proposal" to "first ship completed" in six months. The Apollo Program lasted 9 years from initiation to moon landing. While a lot happened in the US during World War II, it's easy to forget how short the period in question was: American involvement lasted 3 years 8 months and 23 days. Is the sense that there are fewer contemporary examples of rapid progress justified? If so, what's going on? Response to this question from José Luis Ricón. Why is US GDP growth so weirdly constant? If you look at log US GDP over the past 150-or-so years, it is very weirdly smooth. Why? What determines the slope? Would it be correct to conclude that "almost nothing will affect the economy over the long run"? This phenomenon may even extend back further in the US. But it's not like nothing matters; GDP growth between countries does vary a lot, in both the short and the long run. So... what gives? Responses to this question: Alexey Guzey, José Luis Ricón. How do you ensure an adequate replacement rate in systems that have no natural way to die? Schumpeter claimed that the problem of capitalism is not how capital is allocated to existing structures but how structures are created and destroyed. Systems and institutions inevitably get stale or become less effective but also work very hard to survive. (See also: the institutional imperative.) Bankruptcy takes care of senescent businesses. But how do we get a sufficient replacement rate in systems and institutions that aren't naturally subject to extinction processes? How do we help more experimental cities get started? How can we encourage the creation of more cities and more experimentation in their rules? Mark Lutter wrote up some sub-questions. How do people decide to make major life changes? Most days, people don't decide to change their lives in big ways. On a few days, they do. What's special about those days? How much is it about the stimulus versus their own inner state? Why are there so many successful startups in Stockholm? Is Bloom's "Two Sigma" phenomenon real? If so, what do we do about it? Educational psychologist Benjamin Bloom found that one-on-one tutoring using mastery learning led to a two sigma(!) improvement in student performance. The results were replicated. He asks in his paper that identified the "2 Sigma Problem": how do we achieve these results in conditions more practical (i.e., more scalable) than one-to-one tutoring? In a related vein, this large-scale meta-analysis shows large (>0.5 Cohen's d) effects from direct instruction using mastery learning. "Yet, despite the very large body of research supporting its effectiveness, DI has not been widely embraced or implemented." How can we better understand the dynamics of progress in science? We invest an enormous amount of time and money in science. Cumulative progress in science will probably do more than anything else to determine the shape of our collective future. In order to ensure that we're spending enough—and doing so on the right things and in the right ways (maybe we should have more independent institutes, or more funding of promising early-career scientists, or...)—how should we think about measuring the results? Michael Nielsen and I subsequently wrote an article on this topic for the Atlantic. See also the reading list at scientificreturns.org. Emacs, Smalltalk, Genera, and VBA embody a vision of malleable end-user computing: if the application doesn't do what you want, it's easy to tweak or augment it to suit your purposes. Today, however, end-user software increasingly operates behind bulletproof glass. This is especially true in the growth areas: mobile and web apps. Furthermore, not only is it getting harder to manipulate the application logic itself, but it's also becoming harder to directly manipulate your data. With Visual Basic, you can readily write a quick script to calculate some calendar analytics with Outlook. To do the same with Google Calendar is a very laborious chore. As a consequence, we need ever more domain-specific software. Rather than use universal tools for handling charts and for manipulating data, we tend to use separate analytics packages for every conceivable application. This is not all bad. Domain-specific tools can maximize ease-of-use and help amortize the cost of complex, specialized functionality. Sublime's built-in ⌘-T works better than every third-party Emacs package. Still, despite these benefits, the popularity of macros and browser plugins strongly suggest that users are smart and want more control. What's the successor to the book? And how could books be improved? Books are great (unless you're Socrates). We now have magic ink. As an artifact for effecting the transmission of knowledge (rather than a source of entertainment), how can the book be improved? How can we help authors understand how well their work is doing in practice? (Which parts are readers confused by or stumbling over or skipping?) How can we follow shared annotations by the people we admire? Being limited in our years on the earth, how can we incentivize brevity? Is there any way to facilitate user-suggested improvements? What's the successor to the scientific paper and the scientific journal? Are LaTeX'd papers and paid journals really the best we can do? Peer review and modern scientific publishing are quite recent phenomena. In different ways, Distill, the arXiv, Fermat's Library, and Sci-Hub hint that improvement might be possible. What's the right way to understand and model personality? Since the 1980s, the five-factor personality model has gained a great deal of traction. It is ostensibly applicable to a great deal of life. What are its limitations and in which situations should we use it? Could there be more good blogs? It seems that they heyday of of blogging is passing. If so, that's unfortunate. Blogs can be a remarkably efficient mechanism for disseminating ideas and facilitating discussion and debate. (E.g., Sumner's arguments for NGDP targeting.) Twitter is good, too, but there's lots that blogs are great for that Twitter can't replace. Part of the problem with blogs is that they're less rewarding than Facebook and Twitter: your post may perhaps get some thoughtful responses but it doesn't get immediate likes. And part of the problem is, of course, that writing a good post is much harder than writing a witty tweet. Are there incentive structure tweaks that yield more good blogging? Why can't I connect my editor to a running program and hover over values to see what they last were? Why isn't time-traveling debugging widely deployed? Why can't I debug a function without restarting my program? Why in the name of the good lord are REPLs still textual? Why can't I copy a URL to my editor to enable real-time collaboration with someone else? Why isn't my editor integrated with the terminal? Why doesn't autocomplete help me based on the adjacent problems others have solved? Religion is one of the biggest shapers of human civilization. Some of the effect sizes seem quite striking: Jews have won an amazing fraction of all Nobel prizes and Mormons in Utah show extremely strong upward mobility. Schulz and others claim to show how the spread of Christianity in Europe meaningfully changed levels prosocial behavior and the broader structure of society. Henrich writes that "humans do not have a general tendency to help, protect, or harm others. Rather, these behaviors are conditioned by many contextual factors." So, in the broadest sense, what does religion cause? How do various religions differ in the nature and magnitudes of their effects? Do religions consistently cause different things in different regions, as they interact differently with regional cultures? There are a lot of studies with "religiosity" as a variable. What happens when you disaggregate by religion? José Luis Ricón wrote a great post in response to this question. There's some good discussion of the post on the SSC subreddit. Why is there no canon for life's most important questions? If we go to study economics, we quickly become familiar with The Wealth of Nations and Keyne's General Theory. If we become interested in moral philosophy, we swiftly encounter Reasons and Persons and A Theory of Justice. But for many of life's most important questions, we won't find any similar canon. That is, there are no similarly definitive books about how to navigate your education, how to select a career, how to choose a partner, how to be a good friend, or how how to raise your children well. That's not to say that there aren't lots of books on these questions. There are, of course. But there are none that are so good, or important, that you might assume that others interested in the questions will be familiar with their ideas. Is it not possible for there to be "great" books about these questions? Or have they just not been written yet? Why are so many things so much nicer in Switzerland and Japan? Compared to almost all countries (including the US), Switzerland and Japan seem to possess much higher baseline execution quality in almost everything. Buses and trains are better (and more punctual); low-end food is tastier; cheap hotels are much more comfortable; their airlines score higher on international indexes (despite not spending more per passenger); streets are cleaner; grocery stores and corner stores are nicer; ostensibly unremarkable villages have nicer buildings and are more pleasant places to spend a few days. So, what exactly is this effect? Which things are truly better and by how much? Are these effects the result of the same kind of phenomenon in Switzerland and Japan? Could other countries acquire this "general execution capital"? And are there meaningful trade-offs involved or is it a kind of free lunch? Why isn't China (yet) producing a lot of top-tier research? In the fields scientists I'm close to are most familiar with (economics, biology, CS, physics), the consistent report is that little-to-no influential research has yet emerged from Chinese universities. (There's plenty from Japanese, French, German, etc., universities.) 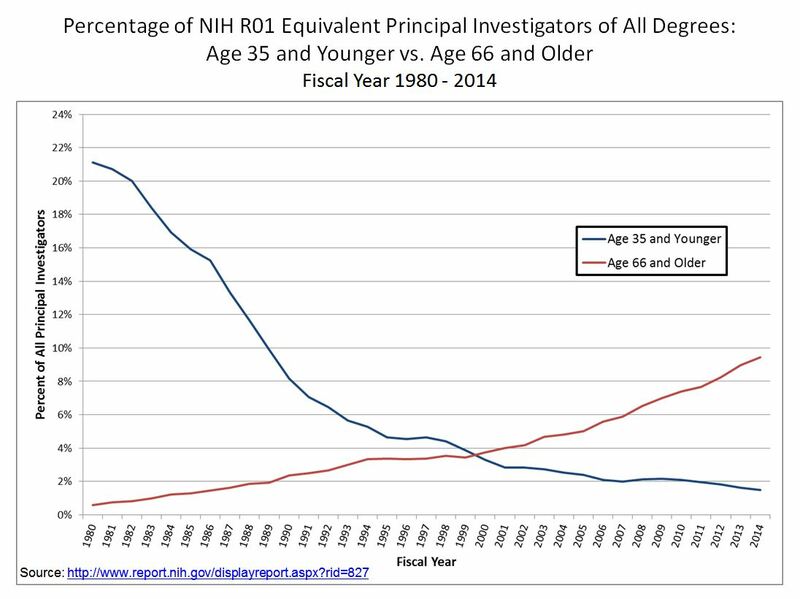 This is fairly clearly not the result of any characteristic of the underlying individuals—Chinese researchers have done, and continue to do, amazing work while at universities outside of China. Citizens of mainland China have won six Nobel Prizes in the sciences, but only one of those was for work done in China. This is despite the fact that China is now apparently #2 in the world in R&D funding. It's possible that we're overlooking a lot of great work done at Chinese universities, although the NSF reports that academics at Chinese institutions publish more peer-reviewed papers every year than academics at American institutions do, so it doesn't appear to be the case that we're simply ignoring Chinese research in aggregate. Assuming there is something to be explained here, what are Chinese universities missing? What influences when people act in accordance with their self-interest and when they don't? People often prefer policies that maximize their own gains. Homeomners, for example, typically favor highly-restrictive zoning policies that inflate the value of their homes. On the other hand, data show that rich Americans seem to consistently favor Democrats over Republicans, which ostensibly contravenes their narrow self-interest. On policy matters, what determines when someone preferences other values ahead of their personal benefit?